Creating a whole world with Fractal Terrains Pro takes 3 clicks. Click the World Settings icon and go to the Primary tab. 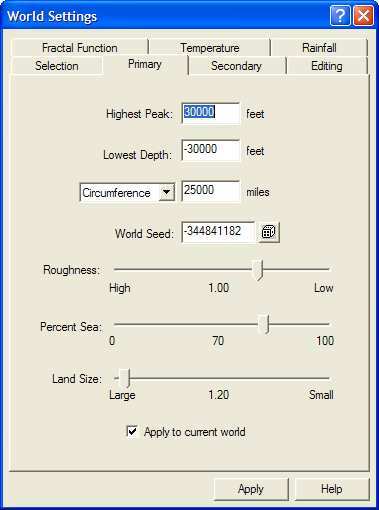 Check the highest peak, lowest depth, circumference, percentage water and roughness values. Change any you want, then click OK to continue. Click the Next World icon. Fractal Terrains Pro generates a new world to play with. Carry on clicking Next World until you find one you like. That's creating worlds at its simplest! With a little more time you can "paint" any altitude or climate adjustments you fancy. And at any time you can change the entire color scheme or map projection. "FT has features that a lot of professional desktop mapping/GIS packages would envy. It's robust and produces sheer eye candy. After playing with the demo for a while I finally forked out the dough... well worth it for a product that exceeds all reasonable expectations."